This cute Baby Girl Cake looks so great with all the other gifts at the baby shower! Check it out below. 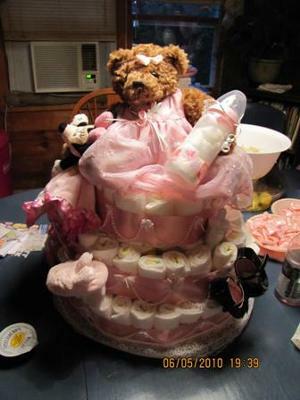 Sandy made this pretty girl diaper cake and put an adorable teddy bear on top. I love the draped bead work on the wide ribbon. 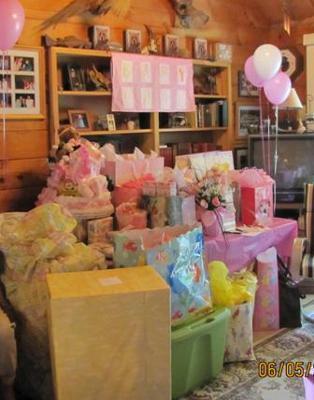 We are so glad to have Sandy's diaper cake ideas on our site! Our site is such a great resource for making your own diaper cake BECAUSE of our awesome readers like Sandy who share their ideas, pictures and creativity. Thanks for your cute baby girl cake, Sandy! This is the second cake that I have done. The first was for a baby boy. This one is for my new niece Abby. On both cakes I have used a Heart Beat Bear for the top of the cake. I use cotton balls to fill the baby bottle to look like milk. Then hook all the goodies onto the cake front and back. 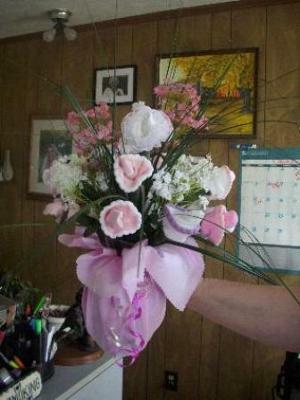 This time I tried the baby bootie flowers. They were a big hit. The only problem was that the mother thought it was too pretty to take apart. Sandy, your this Baby Girl Cake is pretty good and the way you made it is so lovely. I like that you have the skills to do that. I hope to make one similar...thanks for sharing!